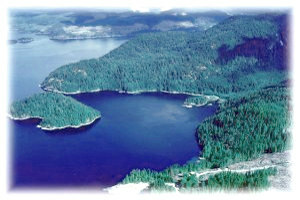 Thurston Bay Marine Provincial Park is located on the northwest side of Sonora Island in th Johnstone Strait. The park provides sheltered anchorage and recreational opportunities for boaters traveling the popular Inside Passage. Thurston Bay Marine Park has two separate portions – one bordering and taking up part of Thurston Bay and the other bordering Cameleon Harbour. Access to the park is by boat only. There are no developed facilities at the park, although random camping is allowed. Visitors can go swimming, fishing, hiking or paddling, or explore the small, pretty beaches dotting the rocky shoreline. An unmaintained trail leads to Florence Lake, ideal for peaceful swimming, fishing and paddling. Thurston Bay Marine Provincial Park is located on the northwest side of Sonora Island, in Johnstone Strait off the east coast of central Vancouver Island. This park is accessible by boat only. Boaters can reference marine chart #3539 and #3543 from more information on this area. Approved Purpose Statement and Zoning Plan [PDF] for Thurston Bay Marine Provincial Park is available in pdf format. There are opportunities for canoeing or kayaking in this park. Kayakers can explore Cameleon Harbour, Handfield Bay, Block Island and Anchorage Lagoon, as well as a number of other interesting islets and coves in and around Thurston Bay Park. Paddlers can also head to Florence Lake. Various species of salmon and rock fish can be found in the waters around Thurston Bay. Fishing is permitted as per provincial and federal fishing regulations. Rockfish Conservation Areas occur within this park. Fishing activities are limited in Rockfish Conservation Areas. Before you go fishing please refer to the Rockfish Conservation Area descriptions available from Fisheries and Oceans Canada DFO. Anyone fishing or angling in British Columbia must have an appropriate licence. Portions of this park are open to hunting for waterfowl only. Hunters must have valid licences and tags. Please refer to the current Hunting and Trapping Regulations and Synopsis publication for closures and regulations. Pets/domestic animals must be on a leash at all times and are not allowed in beach areas or park buildings. You are responsible for their behaviour and must dispose of their excrement. Pets/domestic animals must be under control at all times. You are responsible for their behaviour and must dispose of their excrement.